Occasionally in the morning rush to get to work in time, I will realize that I have forgotten to brush my teeth; on these days I dread going through the rest of the day. On the morning commuter train, when I would normally celebrate the still-empty seat beside me as a small win, rather I worry that everyone is avoiding me due to my foul breath. In the office, I anxiously avoid smiling and interacting with colleagues. In an afternoon meeting I notice my coworker wrinkle her nose when I ask her to pass the agenda. After work I’m supposed to meet up with friends but I bail without explanation and instead run home feeling humiliated and oddly lonely after avoiding connecting with people all day. Passing by a person sleeping in a tent on my route home reminds me that so many of my neighbors don’t have the same access to basic necessities that I have. I almost never have to worry about how I’m going to get things like new toothpaste and toothbrushes. I may have dealt with poor hygiene this one day, but I’ll brush and floss tomorrow and return to chatting with colleagues and friends. I try to imagine what it might feel like to go longer periods of time without basic dental hygiene. The surgeon general suggests replacing toothbrushes as soon as they become frayed with use, but this might feel impossible to someone who carries all their belongings with them each day and can’t afford replacements. Oral health has a profound impact on feelings of dignity and is integral to Simply the Basics’ programs. Helping our neighbors feel dignified, in addition to addressing the long list of physical health concerns related to dental and oral health, are why we distribute thousands of new and unused dental hygiene products every month. Since its inception, Simply the Basics has distributed 72,374 (as of May 1, 2018) dental hygiene products to nonprofits who serve individuals and families experiencing homeless and poverty. By following this distribution model, Simply the Basics saves nonprofits the time and resources required to procure, maintain, and distribute hygiene products, freeing staff up to focus instead on their missions. We give regularly, according to our partners’ needs, providing recipients with regular access to new and unused dental and other hygiene products. We also partner with like-minded organizations to expand our reach, save on administrative costs, and provide more complete care. Simply the Basics’ recent alliance with Project Homeless Connect (PHC) allows us each to expand our dental care programs’ reach and impact. Simply the Basics secures and manages PHC’s in-kind hygiene donations, allowing their staff to focus their time connecting San Franciscans experiencing homelessness with the care they need to move forward. Often, the care they need is professional dental services. While Simply the Basics keeps PHC stocked up on preventative dental care products, PHC’s City Smiles Connect program brings licensed dental care and custom dentures to our recipients, collectively supporting our neighbors’ overall health and quality of life. In a survey conducted by UCSF School of Dentistry over the course of a year with City Smiles Connect, 100% of participants reported that prior to receiving services, poor oral health affected their quality of life, and noted having difficulty chewing due to their teeth, mouth, or denture. 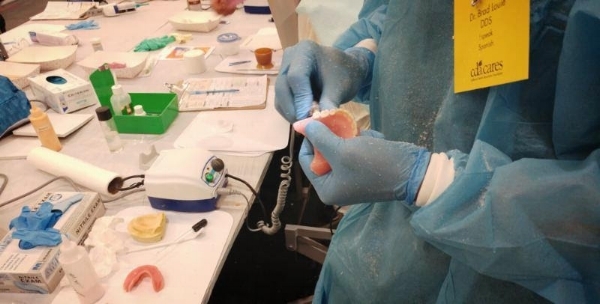 Through PHC’s program, participants can receive a full set of custom dentures in one to two visits which, in addition to restoring confidence and dignity, often allows recipients to chew food for the first time in years. Thanks to our partnership, recipients can receive professional dental care from PHC, and high quality preventative care products from Simply the Basics in one fell swoop. In 2017, PHC provided 146 dentist visits and dentures to San Franciscans experiencing homelessness. Healthy mouths and teeth help prevent infection and support overall physical health, in addition to improving self-esteem and fostering the confidence needed to gain and sustain housing, employment, and support networks. Dental hygiene and health can decide whether someone speaks up in class, goes to a job interview, or connects with friends and family.